It all began because of a disagreement over a used Band-Aid. I declared it toxic waste and told Sam to remove it from his garbage truck immediately and throw it away. 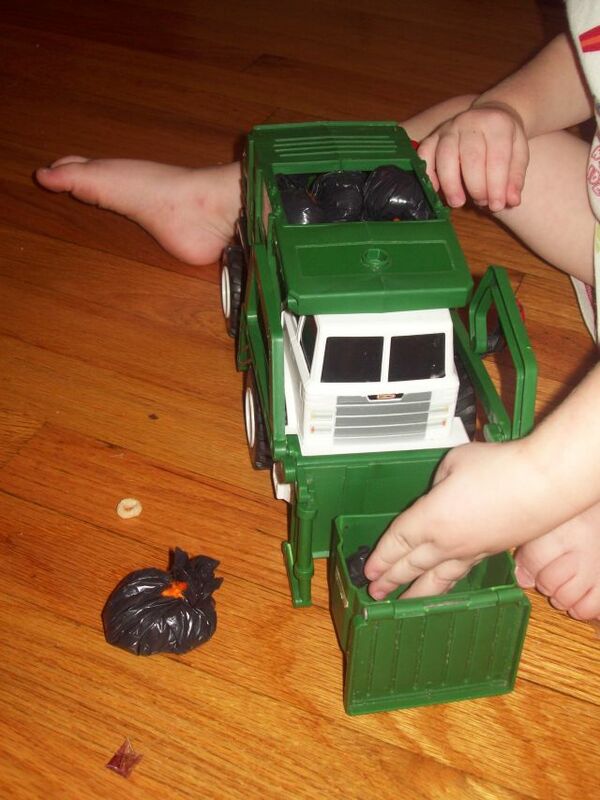 And in his impeccible 4 year old logic, he said, "But Mom, this is a garbage truck and this is garbage. The garbage truck needs to take it to the dump." And we were at an impass. I belong to the pick-your-battles school of parenting, and I'm usually open to just about anything when it comes to creative play, but when I peeked inside Sam's garbage truck to see what other "garbage" was landfill-bound, I was pretty horrified by what he was picking up off the floor. Squashed grapes, rotting apple slices, bits of cat food, dried out pasta, dust bunnies... He was actually filling his truck with trash! "Oh, no, no, no!" I said, horrified. 'We can't have this!" At the same time, I was mindful of the fact that Sam had a tantrum brewing. 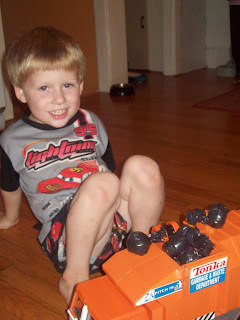 I was going to have to come up with a compromise that we could both live with, because obviously, a boy needs some garbage if he's going to play garbage trucks. And then inspiration struck. "How would you like some garbage bags to play with instead?" I asked Sam. He said he'd like that. Pretty cool, right? Even Tom thought they were cute. I was talking to a friend a while back about the dichotomy between what we thought parenthood was going to be like and what it actually turned out to be. I spend a lot of my time diffusing tantrums, cleaning up toys, making food, and then scraping it off the walls. Before I had kids, I didn't realize that this was what I was signing up for. In my fantasy version of motherhood, my docile little introverts would play quietly with their toys all day, would eat three square meals a day, nap regularly and have diapers of steel. While they played, I could happily write The Great American Novel without interruption on my laptop. On the rare occassion when my children were feeling energetic, I would bring out the sewing supplies and we would quietly and industriously busy ourselves with a series of adorable craft projects, at which point a pair of bluebirds would fly overhead carrying a banner that read "And they all lived happily ever after..."
I was on crack, obviously. But the Garbage Bag Project gave me a(n albeit short) glimpse of the fantasy world I used to inhabit, and shows me that maybe that world-with a few modifications (ear plugs, for example) might be possible. what a wonderful solution, brittany!!!!!!!!! my bluebirds long ago headed for the hills. every once in a while a cackling crow comes winging in, and then i realize it's me. but at least we're laughing our way out of whatever was about to break us. i'm already thinking of too many ways way to do this and i'm sorry it's not a full week's notice for you to get started. Brittany, those garbage bags are adorable. What a great idea & a ingenious solution to the problem. It cracked me up to read about Sam hauling around a bunch of nasty garbage. Boys are SO different than girls! Maggie wouldn't touch garbage with a 10 foot pole. Mommyhood is just a series of challenges, most of which we fail miserably. You nailed it this time! Cathy~ Thanks! I have my moments sometimes. But it's usually spurred by fears of a Health Department visit. LOL I don't do well with writing prompt-y things. I do much better with creativity on the fly, as you can see.